What is the advantage of having a stainless steel omelette pan? There are some pans that make this process easy and there are pans that are simply just not suited to the job. We take a look at this article, at some of the best pans on the market and help you choose which one is right for you. If omelettes are a favorite with you and your family then it makes sense to have something in the kitchen that is used and designed just for this purpose. Like anything else in life, having a specialized tool for a job will make it easier for you to complete your task and help ensure that the finished product is the best you can make. A thick flat bottom – this will allow you to cook at a medium to high temp evenly distributing the heat and reducing the risk of scorching your food and warping the pan. Having the right material in the base such as aluminum in the base ensures a fast and even transfer of heat. Gently sloping sides – are helpful for moving the omelette around the pan when you are cooking helping with flipping and swirling. If pans have a flared edge this ensures that the omelette comes out of the pan and onto the plate perfectly without breaking. Presentation is paramount when producing good food. The right cooking surface – if the egg sticks to the pan then your omelette will be ruined and come out looking like bad scrambled egg. Making sure the surface is nonstick ensures that your omelette never sticks and taking it out of the pan is simple and easy. A good handle – you will need to maneuver the pan to get the best results, it is important to make sure that you have a good handle that is easy to hold and keep cool. The material that the omelette pan that you want to buy will have an impact on how you cook and potentially the quality of the omelette that you produce. You will need to think about things like how well or how the omelette will come away from the pan or how well the heat is transferred around the pan as well as how long will the pan last. Carbon Steel – A decent option as these are extremely durable and they are great for conducting heat. There are some potential issues though, they are not nonstick so you will need to use butter or oil. Carbons steel is also not great for dishwasher and will need to be treated with care (a little like cast iron cookware). Copper pans – There are a few copper pans out there that are pretty decent and copper is super fast at conducting heat. There are some goods ones on the market at the moment so can be an option. They can however on occasion react with the food that is being cooked You should do your research well before choosing this option. There has been some controversy over nonstick and for good reason In this case though if you are buying a pan that is specialized to for cooking egg then the problems associated with using nonstick at high temperatures does not apply. Always make sure though, that you know the limits of the pan and the cooking surface before you buy. If you want to get the best out of your non stick pan for eggs read on. It is important to use the right equipment when you are cooking, if you have a nonstick pan then you should only use silicone or utensils that will not scratch the surface of the pan. It is also important to know the limits of the pan in terms of how you wash and store them. Scratching the surface will reduce the effectiveness of the nonstick coating. There are other things that you should be considering, for example, how do you wash your pans or skillets and do you use them in the dishwasher? We have covered this in this article: Is nonstick cookware really dishwasher safe? Is this the best pan? What Can I say about this pan? Apart from I use it pretty much every day for most of my cooking. It is both robust and elegant and a pleasure to use. Stainless steel offers a number of advantages over other types of pans such as aluminum based pans. The biggest being that it is more robust and so is more long-lasting. Stainless steel pans ten not to warp which is good for glass top and electric or induction stoves. This has been designed for ease of use and built to last. The coating is PFOA free and is triple cured so it does not degrade over time like some other nonstick coatings can do. It has a 5ply construction for the base making it super strong and conducts heat evenly and efficiently every time. This base also makes it induction compatible so it can be used on any cooking surface. The handle is held on with rivets making it long lasting and keeps the handle cool. It just cooks so well and with no fuss – making a decent omelette is easy. Nothing sticks and it is easy to clean, even when something is burnt! There is really nothing not to like about this pan, the only thing that you should be aware of is that dirt can build up around the rivets- using something like an old toothbrush will help with this. This is a very well built product that has been ergonomically designed set that comes in an 8 inch and 10-inch size. This is a reasonably priced option that will give you the choice of cooking for one or cooking for more. The rounded edges make this the perfect cookware for omelettes. The shape of this pan has been designed exactly for this purpose. The ultra smooth coating is good enough that you don’t have to use oils or butter for your cooking should you wish to go for the healthy option. There really is not a lot to dislike about this product. Has a stainless steel induction base. This is a very popular product and is the number one best seller on Amazon in the best omelette pans category. It is is very reasonably priced and comes in an 8 inch, 10.25 inch and a 12-inch version and can be used on all cooking surfaces including induction. The nonstick coating is very durable and scratch resistant. Has the Thermal-Spot heat indicator to show when the pan is heated for cooking. Shallow lip and 1.75 inches deep. There are some stories of the base slightly buckling if it has been exposed to high temps, this would make cooking an omelette in the larger pan a little more difficult. The folding omelette pan is a nifty device that you can use to make things like frittatas as well as omelettes the two below are ones that we think are worth looking at. don’t worry if you are not sure how to use a folding omelette pan there is a video below that will show you what to do. Perfect for the casual cooker. 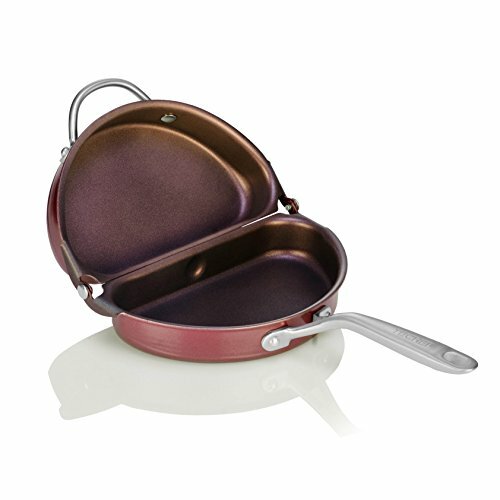 The coating is a rich purple making it a little different from other cookware out there. 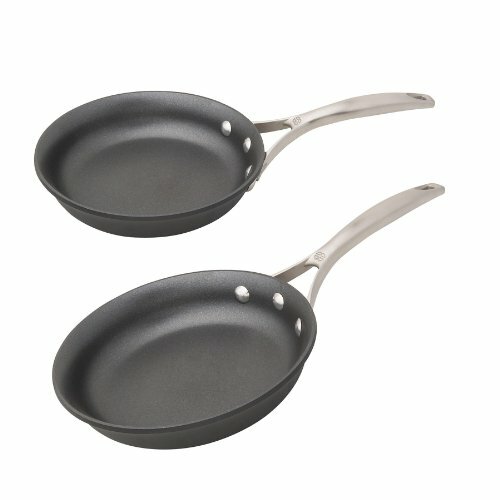 The best omelette pan for frittatas? This is a relative newcomer to the market and has been designed to easily cook Frittata and omelettes for those that prefer less hassle in the kitchen. Very easy to use creating good omelettes with a minimum of fuss. We find this to be a little bit “gadgety”. This is good for making a basic omelette but if you want to try anything a little fancier this is not what you should be getting. This has been made in the USA. These ranges come pre-seasoned and ready to use. This is a cast iron option that is very popular. These skillets if looked after well will last a lifetime and more. The Lodge skillets range from 6.25 inches all the way up to a whopping 17 inches. Cast iron is brilliant for cooking omelettes – if treated correctly. You can use this to cook anything from a delicate omelette to searing a steak. The robust surface that can handle any cooking utensils. If looked after correctly will more likely outlast you! While there is nothing that we don’t like about the cast iron skillet it needs to be noted that cast iron requires a fair amount of maintenance. If you don’t they will rust and will have to be re-seasoned before you use them again. It is a good idea to understand what you will need to do before you buy this. There are few things that are better than a perfectly cooked omelet. In this article, I am going to help you learn how to make an omelet perfectly. To do this are maybe going to have to make your omelet a little different to the way that you normally do. Eggs(I like to work with about 1.5 eggs per person) I recommend that you only cook for a max of two people at a time for best results. Start by gently heating the omelette pan. You can add the butter that you have(this is not vital but I think butter makes it just taste better. while that is warming up you want to beat the eggs. if you are using a hand mixer this will be very fast, you want it so the egg is very foamy and light. leave it to cook … really just don’t touch it .. you will see that it starts to cook, you can lift a corner to make sure that it is not burning. In an ideal world, you will want the omelet to be starting to go a little bit golden and the omelet almost cooked through. there should be a little-uncooked foam for the next stage. Now add your salt and pepper and any other spice you’re felt like adding. Now add the cheese, make sure you now put all of the grated cheese on one-half of the omelet as you are about to fold the omelet. Fold the omelette so that the cheese in on the half that is still cooking. leave it like this for about half a minute or so and then flip it over. You don’t want to do this for too long, perhaps 30 seconds each way, this will melt the cheese. While all of these choices will do the job there are some that are better than others, for us the fold over pans would not be an option so much not because of quality rather that they would limit what we can cook with them. The one that stands out about the rest is the Calphalon Unison Nonstick 8-Inch and 10-Inch Omelette Pan Set. This has all the features that we feel are important in an omelette pan and on top of that is good quality at a reasonable price.You also get two pans that cover the most popular sizes making this a very practical option as well.